This is my newspaper of choice when in Europe or Asia. It is owned by the New York Times, one of the world’s great newspapers, and has a good coverage of news from around the world as well as an arts section sometimes including book reviews and an excellent sports section. *The former Czech president Vaclav Havel has finished a new play that he says could be his last. Havel, 70, was a prominent dissident playwright when he led the 1989 revolution that peacefully toppled communism. He became leader of Czechoslovakia in 1989, and served as president of the Czech Republic after it split with Slovakia in 1993. His new play refelects on the 18 years he spent in politics. “I have not written a single play over the last 18 years”, Havel told the Respekt weekly. “Living in the world of politicallanguage was quite an inspiration” he said. In the play “I try to reflect the automatic political language, where you say one word to which other words are immediately added and the cluster then travels from one speech to another”. I was particularly interested in this report as in David Remnick’s book, Reporting, which I read on the plane on the way over and wrote about on my blog yesterday, one of the pieces was a fascinating account of his interviews with Havel’s at the time he was stepping down from office. Called Exit the Castle: Vaclav Havel, Remnick’s story also included a look back at his Havel’s rise to power and his time as President. *Per Petterson of Norway and his translator Anne Born have been named the winners of the 12th International Impac Dublin Literary Award. The US$133,000 prize, billed as the world’s richest literary award for a single work of fiction in Englsih, honored Petterson’s novel, “Out Stealing Horses”, about an isolated Norwegian widower whose chance encounter with a character from his youth revives painful memories, Reuters reported. Petterson, 54, a bookseller before becoming an author, said, “With money like this, it can buy a lot of time to write and no hunger for some time”. Born will receive a quarter of the prize money. Petterson’s competition included seven books by JM Coetzee, Salman Rushdie, Jonathan Safran Foer, Cormac McCarthy, Peter Hobbs and Sebastian Barry. There was also a longish and entertaining story by Tyler Brule (editor-in-chief Monocle magazine) on a small coastal town in Tuscany called Forte dei Marmi which he has been visiting for 10 years. On Tuesday I watched a pair of Russian women, say mid-20’s, getting bicycle lessons. After 10 minutes of trying on two wheels, they ended up settling for tricycles with big baskets set between the back wheels. It struck me that these young women had probably gone straight from their prams to the back seat of an armored BMW 7 series and had never grown up with that wonderful feeling of being able to navigate a town on your own with the wind rushing up your arms and behind your neck. Since then I’ve noticed a lot of young Russian women on tricycles that are usually favored by Italian grandmothers (none). I’ve been wondering whether its become a status thing to have three wheels instead of two, or if its simply more practical because you can get more shopping bags in the back of your trike rather than in a front basket. 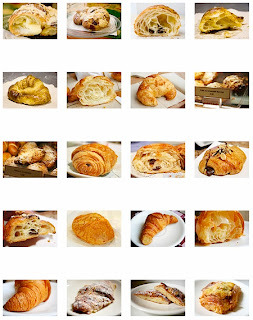 And have a look at this great piece about the search for the perfect croissant in Paris. The International Herald Tribune is a great newspaper which some days can keep me quiet for an hour!